The Martian Simulacra is out now from NewCon Press. When the Martian Ambassador beats a path to 221B Baker Street, seeking the great detective’s help in solving a grisly murder, how can Sherlock Holmes refuse? The case will involve a trip to the Red Planet, which few humans have been privileged enough to visit. Ever since the second wave of Martians arrived on Earth, inoculated against the germs that halted them the first time around, and humanity accepted the aliens as their overlords, Sherlock Holmes has been curious… Soon he and Watson are boarding one the the great Martian spaceships, where they discover that their old friend Professor Challenger is also en route to Mars. What awaits them at their destination is a plot more dastardly than any of them could have imagined. 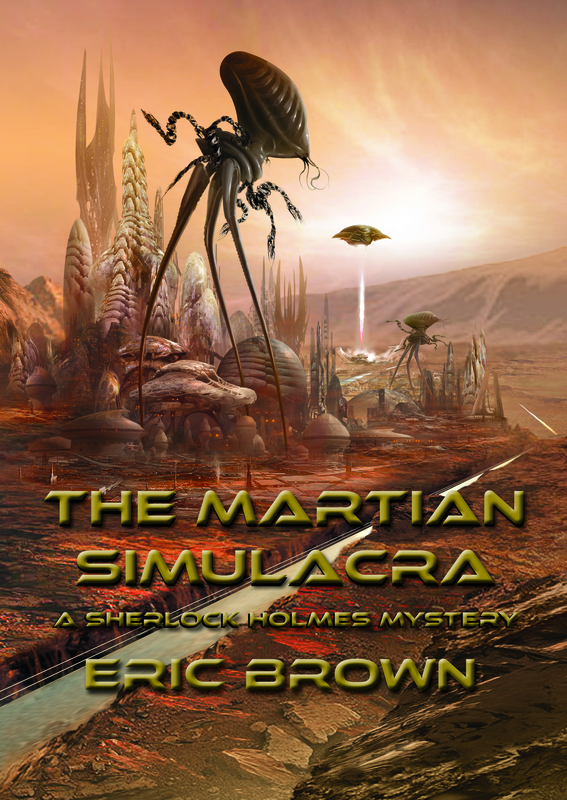 The Martian Simulacra is a glorious mash-up of Sherlock Holmes and The War of the Worlds, seasoned with a dash of Conan Doyle’s The Lost World for good measure. 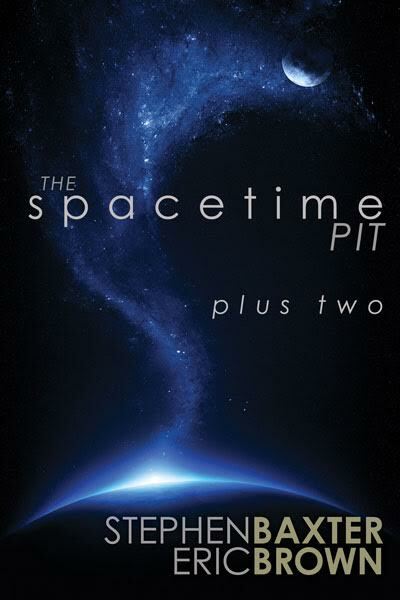 The Spacetime Pit Plus Two collects three collaborative stories by Stephen Baxter and myself, never before published in one volume. In “Sunfly”, Onara and her people live on a world very different from our own – a vast ribbon encircling a sun. But a change is coming to the land, a mysterious narrowing that threatens not only the stability of her world, but the very order of everything she has taken for granted. Collaboration between writers is a curious process. I’ve tried writing with a number of authors, and it often doesn’t work; there’s no initial spark, or our writing styles, and methods, are too dissimilar to forge an effective working relationship. It doesn’t matter how much I like the other person, or how similar our ideas about life, art and politics might be – if there isn’t that elusive, almost alchemical spark at some point in the process, collaboration is doomed to a series of false starts and aborted stories. My most prolific writing partner is Keith Brooke: together we’ve written more than a dozen stories, two novellas and a novel. With Keith, the process is wonderfully easy. What isn’t so easy is finding the time to write something together: we live at opposite ends of the country, and for much of the time are often engaged on solo projects. On the rare occasions that our busy schedules afford us a window of opportunity, we swap ideas until something sparks, and not long after that we have a fully-fledged story-line, which one of us begins and then the other takes up, and so on, until the tale is finished. The second writer I’ve collaborated with is the late Michael Coney, author of such classic SF novels as Brontomek!, Hello Summer, Goodbye, and The Girl With A Symphony In Her Fingers, as well as a host of excellent short stories. Although we lived half a world apart at the time, Mike in British Columbia and I in England, we corresponded by email and over the period of six months wrote a long short story, the biological murder-mystery set on an alien world, “The Trees of Terpsichore Three”, which was published in the Scottish SF magazine Spectrum 8. I’ve also collaborated with my friend and fellow curry aficionado Tony Ballantyne, author the Hard SF novels Recursion and Twisted Metal, and one of my favourite fantasy novels of all time, Dream London. A while back I wrote a series of stories about a race of aliens who come to Earth and bestow the gift of voluntary immortality on the human race. Tony liked these tales, and had an idea for one. He started the story, I took it up and finished it, and then we each rewrote the other’s sections. “Matthew’s Passion”, collected in my fix-up novel Kéthani, is the result: Tony imbued the tale with spirituality and his knowledge of music, attributes I signally lack. Which brings me to the collaborations which form the content of the current volume, The Spacetime Pit Plus Two, and my collaborator, Stephen Baxter, the author of such ground-breaking novels as The Time-Ships, Evolution, The Light of Other Days with Arthur C. Clarke, and the Xeelee story sequence. I first met Steve at a science fiction convention, the Nottingham MexiCon of 1989. We’d both just started selling short stories to markets such as Interzone and David S. Garnett’s Zenith anthologies, and were in the process of writing our first novels. Not only did we have our writing in common, and our love of the genre, but a passion for football: Steve follows Liverpool, while I, for my sins, suffer the travails of Leeds United. We got on well, and it wasn’t long before one of us suggested collaborating on a story or two. This was over twenty years ago, and sad to say I have no recollection of how we went about the process of collaboration, though Steve reminds me that we worked on “Spacetime…” when I visited him in Prestwood in the summer of ’95. I do recall that I had the initial idea for “The Spacetime Pit”, which Steve, with his scientific and technological nous, proceeded to pull apart at the seams and stitch back together in a way that would work. It’s a grim tale that spans billions of years, but has the dilemma of a human being at its very core. “Spacetime…” won the 1995 Interzone readers’ poll for best story. The second story in the volume is “Green-Eyed Monster”. By contrast, it’s a light-hearted tale about bodily transmogrification, love and jealousy. It’s nice to be able to write a tale from the viewpoint of a toad from time to time. I rarely write humorous stories, but on rereading this one I found myself chuckling: Steve must have written those passages. The final story, “Sunfly”, is a strange tale set on a very alien world – a strip of land girdling a sun – and follows the exploits of student Onara as she comes to understand not only her world but her destiny within its complex history.